DeLux is D-licous! And now has a Gluten Free D-Luc Burger! It was not too long ago that I was emailing DeLux Burger Bar in Edmonton about gluten free options. At the time, although they did not have a specific menu option, I was responded too with open arms by the executive chef and the owner about how far they will go to accommodate a gluten free option. Even so far as to make a specific gluten free patty and run out and get any specific gluten free products needed like a Kinnikinnick gluten free bun. Well, DeLux just made it a whole lot easier for themselves, and their gluten free customers in Edmonton, as their new menu now offers a Kinnikinnick gluten free bun with the Guilt Free Burger which is 100% organic beef! Update April 20, 2010 After a recent visit to Dlux Burger Bar we were able to enjoy a gluten free burger and appreciate the wait staff efforts to ensure we do not eat anything we are unable to eat. With that said, please note that their french fries are fried in the same frier as other battered items, so it is not recommend that Celiac's order french fries or anything that contains a deep fried item. A member of the staff is Celiac, so if you want extra comfort, ask to see if they are on shift. 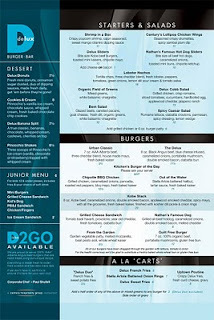 Check here to view the DeLux Burger Bar menu. You can follow DeLux and Century Hospitality Group on Twitter @centuryhospo Let us know how your DeLux experience was! Unfortunetly my trip to Delux was not as good. I arrived excited to order the gluten free burger. They did allow me to order their special that month (Chris K burger) with a gluten free bun and burger - instead of sticking to their one option. However, I was told after I ordered that they were out of gluten free buns. They did prepare it on lettuce - but it was not the same. However, as a saving grace they did not charge me for the meal and did act genuinely sorry. The burger was a little greasy - but I probably wouldn't have noticed as much if it were on bread. I am hoping to return to give it another try - but I will definetly call ahead before I go. That is unfortunate that they ran out of the gluten free buns. Good news is that it may encourage other burger places to have gluten free buns considering that DLux is running out! I do agree, their burgers tend to be greasy, however I have learned that burger patties with no breadcrumb fillers are like that because breadcrumbs tend to absorb most of the grease. I was horribly sick after eating at the WEM DeLux. I ordered the Urban Classic on a gluten free bun. Now I'm wondering if they don't use some type of filler in their patties? The meat was pretty fluffy to be 100% beef. My question is if they do use filler, why would they offer a gluten free bun, kind of pointless if you ask me. And if their only 100% beef with no filler patty is the organic, perhaps they should have said something? I will never ever go back there. That is an unfortunate experience. However you are correct, DeLux does use filler in all their patties except for one called the "Guilt Free Burger". It is unfortunate that the staff at WEM DeLux did not make the connection with the gluten free bun and using the Guilt Free Burger Patty. I would recommend contacting DeLux Burger Bar or their head office. They should be made aware of any incidents to allow them to assess their staff training. Do they use kinnikinnick buns still? Went to the original Delux location on my birthday back in June. Our server there did let us know that ONLY the 'guilt free GF' patty was gluten-free. However, oh man did the wife and I enjoy them on pretty tasty GF buns. With bacon. And cheese. Om nom nom. Delux is greasy and bad for you and so delicious. Though I know now to only order a single side-order of fries - they're huge! Even better, they offer a banana split for dessert and unless they're something goofy in the sauce we were told it was GF too. I don't think Delux is for everybody, even regular burger-wise, but it's right up my alley. I've had great experiences at the WEM location. The staff was super knowledgeable about what I could and couldn't have. They even told me they have a separate frier for gf fries.. so I was able to enjoy those as well. My burger was great.. and even though I had to have the 'Guilt free' option, they let me pick all my own fixins (I replaced the mushrooms with pineapple). It's always a nice treat! On Valentines Day we went to the location on 142nd and my burger was over cooked, but I didn't get sick. Next we want to try the WEM location. It's great to be able to go out and enjoy a burger again. So a little more details… the West Edmonton Mall location has a large kitchen and a dedicated fryer for the gluten-free fries. The Crestwood (142 Street) location does not, and they will warn you depending on how sensitive you are, you might decide to try. The chefs are very knowlegeable, they really do bust a move to make sure your food is good. You can follow them on twitter too if you want to chat with them, they'll listen.